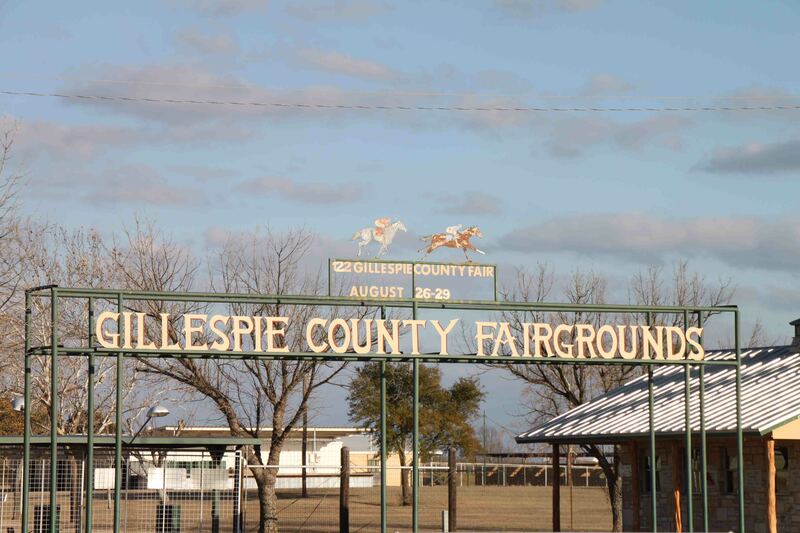 After a wonderful evening with Molly, I headed West, past Austin and into the hill country. My first stop of the day was at Pedernales Falls State Park. There was a chill in the air, but the sun was shining as Petey and I followed the Wolf Mountain Trail lined by mesquites and maples to Twin Falls. To my surprise, the falls weren’t flowing. I thought the snowmelt would have produced at least a trickle, but the area has suffered a massive drought in recent years. The creek filled oasis beneath the falls, however, was breathtaking. Frankly, I don’t believe I’ve ever seen aqua colored water in my home state. The Trinity River and the Texas Gulf Coast are generally brown from silt (as well as pollution) and the North Texas lakes are manmade, thus usually murky grey or green. I can’t say there has ever been a body of water in Texas that I was thrilled to jump in except a swimming pool! I heavily considered dipping my feet in this small pool of water, but ground level was not that easily accessible with a dog, camera, and backpack in tow. 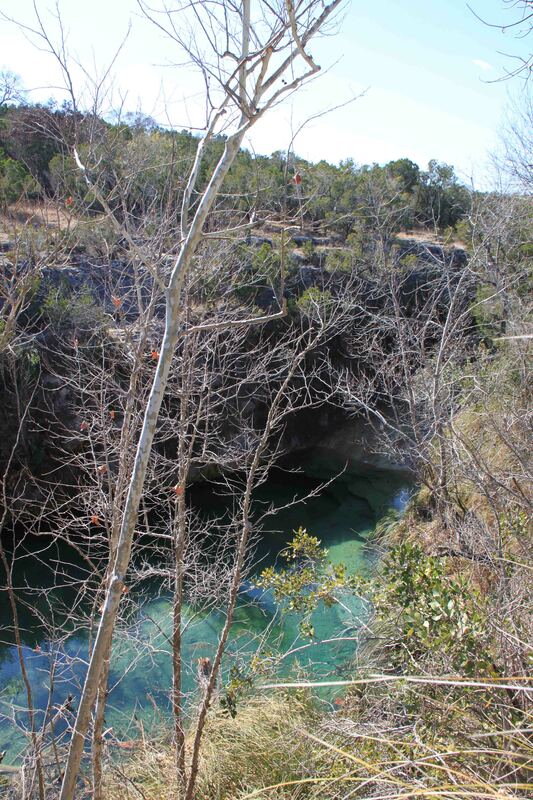 We returned to VANilla after a two to three mile walk to take a short drive to another area of the park to see Pedernales Falls. 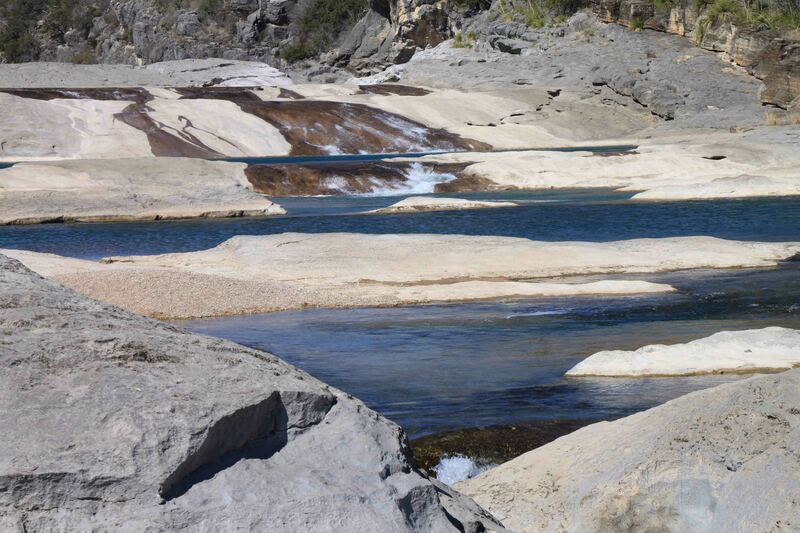 The Pedernales River flows over and through protruding rocks to create the falls. Petey and I hopped over the rocks for a closer look, but obeyed the signs: no swimming, wading, or tubing on this portion of the river. While the river appeared calm and harmless, evidently the rocks create strong currents and undertow. In addition, the area is subject to flash floods, which I can believe. As a freshman in high school, our class took a trip to YO Ranch for a bonding experience. The class was divided into three small groups and given different scheduled activities. My group was going camping. One task included building a fire with only two matches to cook hotdogs…no fire = cold hotdog. Unfortunately, all the nearby wood was soaked from recent rains…not the best lunch I’ve ever had. The excursion turned worse when torrential rains flooded the river and trapped us in the hayloft of a barn for the weekend. The river, so high, washed the school bus away!! Eventually, our group made it back to the main cabin area unharmed, just in time to go home to Dallas. Thankfully today, no snow or rain, so the rivers were tame, but the wind was howling. Gusts were so strong that VANilla blew onto the shoulder of the road. Windmills spun as fast as they could go! 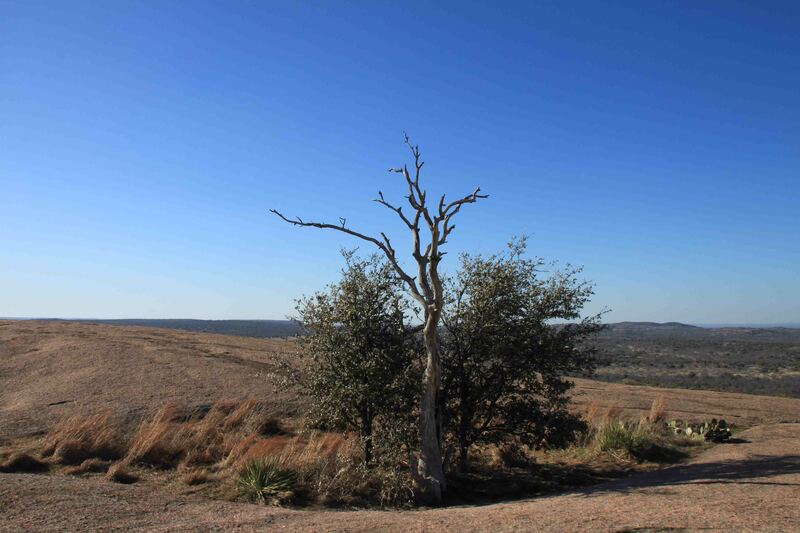 Deer, antelope, and longhorns peppered the countryside and a road runner played chicken with VANilla as we continued through Main Street in Fredericksburg to finally reach Enchanted Rock State Natural Area. 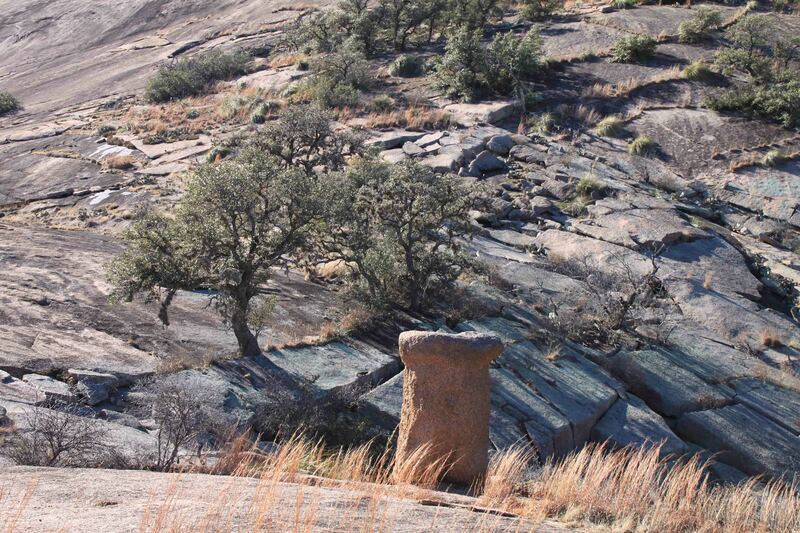 Enchanted Rock is a small part of a huge underground rock known as a batholith. The batholith is over a billion years old and spans over 100 square miles (4 times the size of Manhattan). 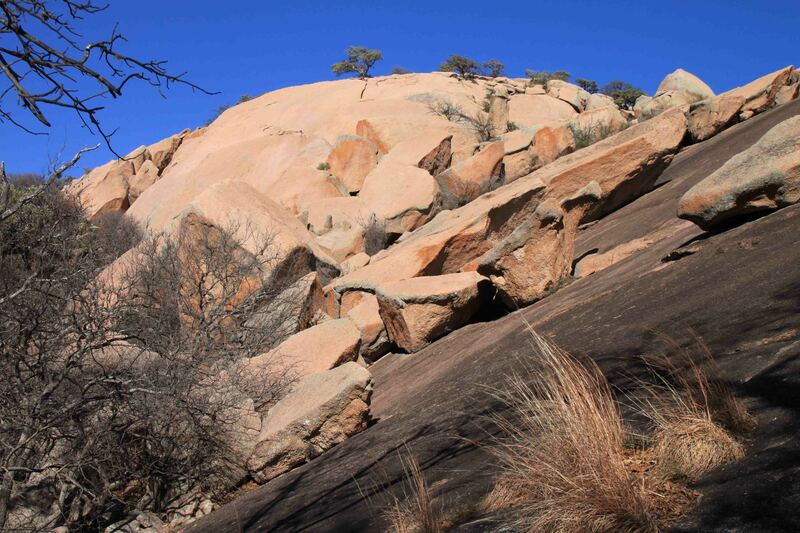 Enchanted Rock is the second-largest mass of exposed granite in the United States. It sheds its outer layers of rock as it contracts and expands creating a variety of oddly shaped granite fragments that sometime slide down the dome. The rock also illuminates in the moonlight. The noise and light reflections at this mound of pink granite caused the Indians to think it was possessed by supernatural powers! Petey and I hiked a few miles around the area and then took the Summit Trail to the top of the dome, where one tree and some grass grew from the top. 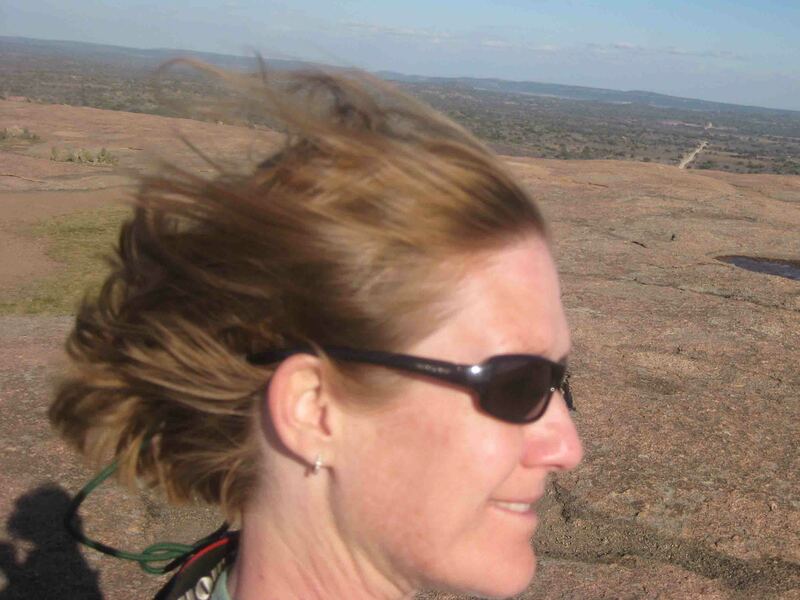 We didn’t stay long, as the wind was so strong, my hair blew back just as it did when I went skydiving! Hope you have time to visit Camp Mystic. Happy trails! !